"Bedelia, squirrels are nice and fluffy." Being a princess is no easy feat. Well, for those willing to accept the role and the preconceived notions that come with it there's little to do. But for those who want more out of life than just being a damsel in distress, well, the adventuring can be a little difficult. Not so difficult that things are impossible, but difficult nonetheless, especially for a character such as Adrienne in Princeless: Be Yourself #1 from Action Lab Entertainment. The issue is written by Jeremy Whitley, illustrated by Emily Martin, colored by Brett Grunig and lettered by Emily Spura. Adrienne and Bedelia are off to the swamp to rescue Adrienne's sister Angoisse, but when a crash landing leaves them separated and stranded in a swamp full of dangerous creatures, Adrienne, Bedelia, and Sparky must face their fears just to find each other. 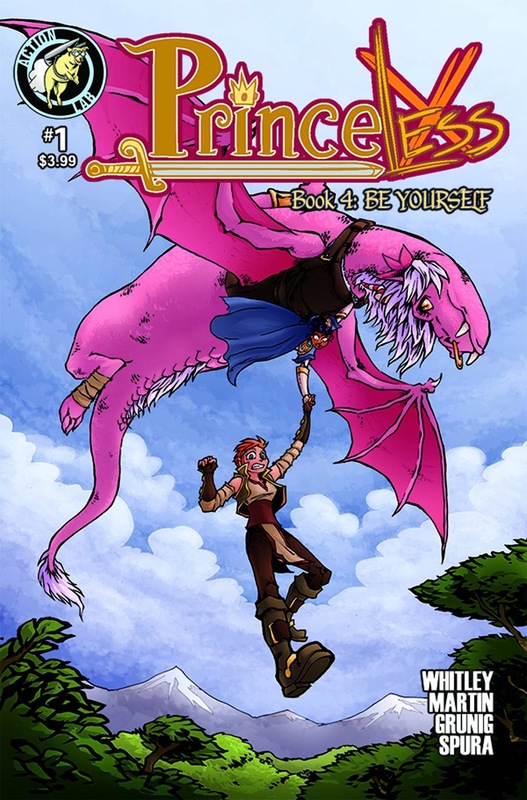 Princeless: Be Yourself #1 continues the quest of Adrienne and readers who have read the previous volumes will feel right at home here. Whitley has a clearly established heroine in Adrienne and her pairing with Bedelia offers plenty of room for action and entertainment. Whitley offers up some gender reversal in the book as well, with Adrienne's brother being forced to reconcile his desire to be a tailor with his father's desire for him to be the quintessential man. Princeless seems to have gained a reputation as being all about empowering women, but Whitley uses it for much more than just that in focusing on gender roles in general. Aside from the bucking stereotypes, there's still the requisite humor that accompanies Adrienne and Bedelia continually making out of the frying pan and into the fire. The artwork in Princeless: Be Yourself #1 maintains a familiar look that--again--fans of the series will find welcoming. Martin's portrayal of the characters presents them as cartoony in many regards, yet emotion is afforded a bit more leeway. For instance, the King looks likes a Disney character in many ways, but when his anger bubbles to the surface it's very clearly visible. The background settings are detailed enough where the reader can easily discern where the characters in question are. Grunig's colors feel a little muted throughout, not really offering a lot in the way of contrasting characters from one another or the backgrounds they're interacting with. Princeless: Be Yourself #1 is another solid entry in a very safe franchise. Adrienne and Bedelia are pretty much still up to their requisite hijinks in their seemingly endless quest, even finding themselves invited to a goblin dinner. Whitley maintains a certain level of humor that masks deeper themes of gender roles and identities. Martin's illustrations are pretty carefree and provide a cartoonish feel to the proceedings that ensures the book doesn't get bogged down in its messages. Princeless: Be Yourself #1 still maintains an all-ages appeal and is a great start to another volume. Princeless: Be Yourself #1 is in stores now.